Charming 4-bed, 4-bath frontline golf townhouse close to Marbella. Special features like own lift, fire place, jacuzzy, spacious garage. Possibility of extension in the basement. Ideal family home or investment property. 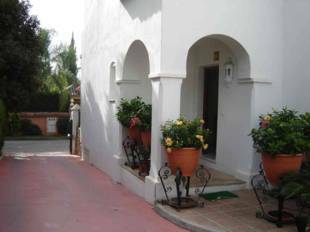 Fabulous three level townhouse located in a very quiet Andalusian style complex with charming narrow streets, trees, 2 restaurants and a picturesque small church. Reformed in 2000. South and North orientation. This property comprises: a large patio, parking space in the complex, guest toilet, alarm, rustic flooring. 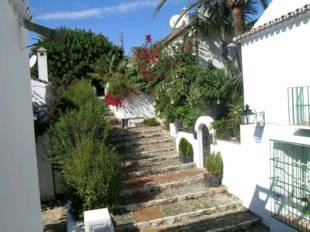 Beautifull south facing town house in an urbanisation in Marbella. It is very close to Puerto Banus and easy acces to the motorway. It comprises of 3 bedrooms, 3 bathrooms, fitted kitchen, garage and a 1 bedroom, 1 bathroom granny flat in the basement. It is surrounded by tropical communal gardens and a pool. Other features include fitted wardrobes, laundry room, hot & cold air conditioning, BBQ, solarium and fireplace. 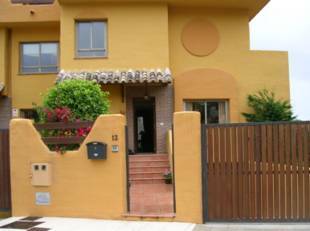 Lovely modern townhouse of 266m2 located in a quiet residencial area in a beautiful complex. 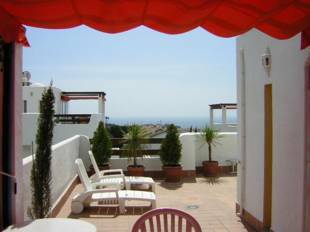 The property benefits from a great sea view from the large roof solarium which alsio has a jacuzzi. There is also a private garden area with a barbecue, plenty of entertainment space! There are 4 bedrooms and 3 bathrooms all tastefully decorated, 2 of which are beautifully tiled and 1 with grey/white marble. The kitchen is also modern and tastefully done. In total the property is of 390m2 with 83m2 garage with space for 2 cars or more and 60m2 bodega and terrace areas. Viewing is a must to appreciate this lovely, ready to move in property! 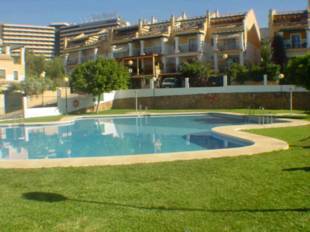 Nice townhouse situated just a few minutes from Marbella centre. Set in a private complex with communal gardens, swimming pool and a children´s park is the perfect residence for a family. The accommodation comprises 4 bedrooms, two bathrooms a guest toilet, big living-dinning room with fireplace, fully fitted kitchen, sunny terraces, guest apartment or big storage. Private parking and air conditioning pre-installation. A 3 bed, 3 bath townhouse situated in a sought after urbanization in the prestigeous Marbella area. This property enjoys private and communal gardens with pool and waterfall. An ideal family home the property has extensive storage areas, a fitted kitchen and access via electric security gates.